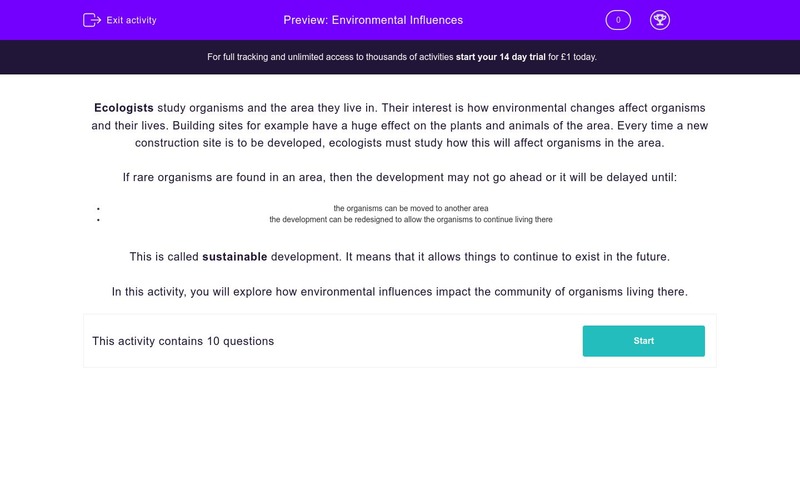 In this worksheet, students will practise the environment an organism lives in and influences it. Ecologists study organisms and the area they live in. Their interest is how environmental changes affect organisms and their lives. Building sites for example have a huge effect on the plants and animals of the area. Every time a new construction site is to be developed, ecologists must study how this will affect organisms in the area. This is called sustainable development. It means that it allows things to continue to exist in the future. What type of scientists study organisms and the areas they live in? What is the issue with new building sites? They may not be big enough for purpose. They may affect organisms that live in the land. They may be very expensive. Suggest a possible effect building sites may have for organisms that live in that land. It will destroy the land they live. It will provide more space for them. Suggest another possible effect building sites may have for organisms that live in that land. It will destroy any small plants. It will destroy their food. It will change the weather. Before a new building site is designed,﻿ it is necessary _____________________________ . If rare organisms are found in the area where a new construction site is about to be developed, ﻿building ___________________________________. Suggest a possible solution when rare organisms are found where a new building site is about to be developed. Why does a construction sometimes need to be delayed when rare organisms are found in a possible building site? There is not always a delay. The rare organisms are moved. The building is redesigned to allow organisms to continue living there. What does sustainable development do? It is about building anywhere in the country to ensure housing for people. It allows things to continue to exist in the future. It is about moving organisms to other places they can live in. Try to estimate how many new homes are built in the UK each year. Ecologists study organisms and the area they live in. New building sites may affect organisms that live in the area. New building sites may destroy the land that organisms live in. It is like someone destroying your home to build a new one for them. New building sites may also destroy the food of organisms that live there. Plants and animals are everywhere. When building a new site, it is essential to take into account how it will affect the organisms that live there. Building is not allowed to go ahead. Construction is sometimes delayed so that the rare organisms can be moved or so that the building is redesigned to allow organisms to continue living there. Sustainable development allows things to continue to exist in the future. About 180,000 new homes are built in the UK each year!